Grazing management on technograzing systems has allowed some producers to more than double their output per hectare compared to set-stocking. Hannah Park and Hannah Noble find out more. Technograzing at the Stobart brothers farm in Armathwaite, Cumbria. Technograzing is a grazing management system which can sustainably increase production per hectare through improved grazing efficiency. The concept was originally developed in New Zealand by Manawatu farmer Harry Wier more than 35 years ago. Mr Wier wanted a grazing system which would allow him to regularly move large numbers of animals in small groups with minimal labour. On this system, animals are generally moved every two days or three times per week, based on dividing fields into long, relatively narrow paddocks, known as ‘lanes’, using semi-permanent electric fencing. In general, systems might have anywhere from two to 12 lanes, each 40-80 metres wide and 300-1,000m long. Fence posts which form ‘lane fences’ are positioned using GPS to an accuracy of 20mm and serve as markers to indicate ‘cells’, which are normally about 0.05-0.1 hectares (0.12-0.24 acres). Temporary electric polywire fences are used to split the lanes into these cells. Three fences are used per system comprising a back fence, a front fence and a safety break, which run perpendicular across all the lanes. James Daniel, director of Precision Grazing, a company offering technograzing consultation services in the UK, says: “Improving farm profit is about increasing the productivity of the land and labour within a business. “This system has allowed producers to increase output per ha by 50-100 per cent, compared to set-stocking through increasing pasture growth and utilisation, while improving soil fertility and reducing inputs of N, P and K fertilisers. Mr Daniel says the basics of rotational grazing are ensuring animals do not spend too long in once place, followed by providing a sufficient rest period before the next grazing. As a guide, he says if a field at the target pasture height cannot be grazed within a week, the group of animals needs to be bigger or the field needs to be made smaller. “To start with, target a stock class which will deliver the best return, such as growing cattle or weaned lambs, and allocate them to four fields, moving weekly. Thomas (right) and James Stobart have introduced technograzing. 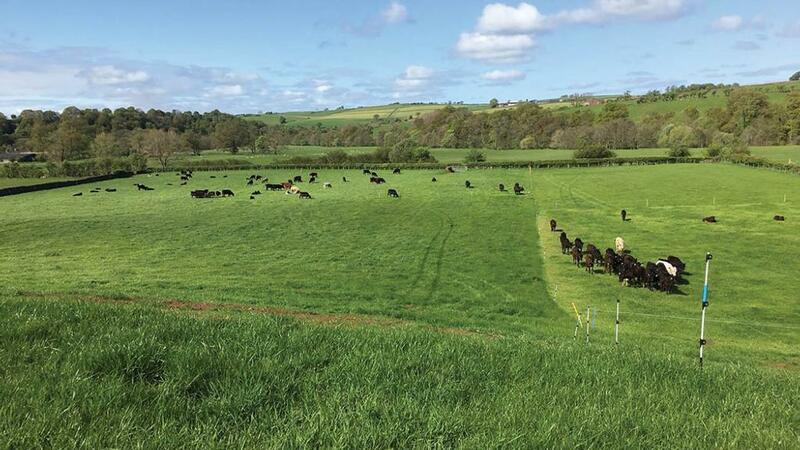 In a technograzing system, animals are able to capitalise on the spring surplus, as it provides the infrastructure to transition animals at relatively high stocking rates to pasture early in the season, Mr Daniel explains. “This growth arrives for free and the better it is utilised and converted to liveweight gain, the higher the potential for profit. “Animals allocated one cell per day in a 60-cell system will have a 60-day rotation. This may increase to 1.5 cells per day, which would reduce rotation to 45 days, or two cells per day which would make it 30 days, and so on. Operators walk or drive a nominated lane every seven to 10 days and measure the average cover height using a platemeter. This is compared to the calculated target height for each month. If it is above target, this indicates surplus feed availability and the rotation length is reduced to increase animal intakes and maximise growth. In a feed deficit, the rotation length is increased to provide pasture with a longer rest period. On-farm, the system will generally be installed on the most productive land area and managed as a dedicated enterprise. 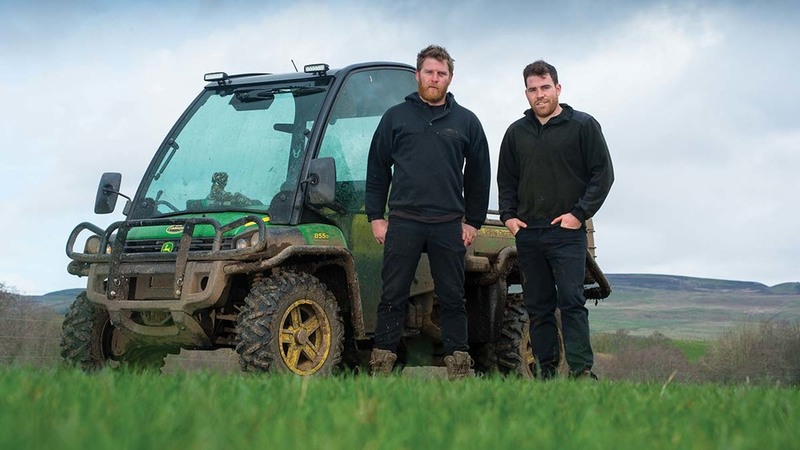 Brothers Thomas and James Stobart recently bit the bullet and created a technograzing system on their farm in Armathwaite, Cumbria. Feeling inspired following trips to New Zealand, where the pair had seen technograzing in practice, and with the support of their father George, they decided to give it a go at home. A total of 12.5 hectares (31 acres) of the farm has been set aside, dedicated to technograzing. It is split into four lanes, much like a horse-racing track, with the longest being 800 metres. Lanes are separated with semi-permanent fencing, which is three strands of high tensile wire with fibreglass posts. Lanes are then split into cells which allow for accurate allocation of land. Working with Precision Grazing’s James Daniel, GPS information of the farm was sent to NZ, where it was analysed and exact measurements and locations of each 0.07ha (0.17 acres) cell were calculated. The system is currently grazed by 100 Wagyu heifers and steers on a rearing contract with Warrendale Wagyus, near Pocklington, East Yorkshire. Stocking density is 2,000kg/ha (809kg/acre) of liveweight and animals range from 12 to 22 months old. There are 172 cells in the whole system, with the required number of cells calculated using grassland management software from NZ, which looks at grass cover and livestock demand. Currently, cattle require four cells per day, meaning there is a 43-day rotation. However, they have access to eight cells which will be their requirement for two days between moving fences. Rotation length can be extended or decreased depending on drops or increases in grass cover to ensure dry matter requirements are met. Cattle move on to the next batch of cells three times-a-week, no matter what grass cover is left. The front fence is dropped and cattle walk over it, then it becomes the backing fence. Thomas says: “This summer, some animals have been moved out of an area with residuals of up to 1,800kg to 2,000kg DM/ha, which has been a big learning curve for us. You have to have a totally different mindset. We have even cut some of the technograzing for hay when the growth got ahead of us. Water is provided by 80-litre drag-troughs, which can be attached to the back of the quad bike and moved on to the next batch of cells. They are fed with pipes from a mains supply, which can reach the whole length of the technograzing area. The brothers are in the infancy of their venture into technograzing and have recently invested in a weigh crush to allow them to record information on daily liveweight gain. Thomas says: “We have recently started weighing cattle every six weeks. Once we collect data, we hope to see a significant increase in performance on the new system. We are pleased with growth so far. Another part of the farm is earmarked for possible conversion to technograzing, but for now, focus is on the current system and making it as efficient as possible. Thomas says: “In the future, it may be a possibility to run batches of weaned lambs through the technograzing system, as it will be clean pasture. However, we would like to focus on cattle for now.